“A [Queen’s Counsel] appointment is a mark of recognition to honour lawyers who demonstrate exemplary service to Canadian society through their dedication to the law and to Canada’s justice system.” (Minister’s Transition Book, Department of Justice) Among members of the Bar itself, getting the designation is sometimes referred to in English as “taking silk.” This is because when you get the designation you become entitled to wear silk robes that are also cut differently from the plain black cotton robes. 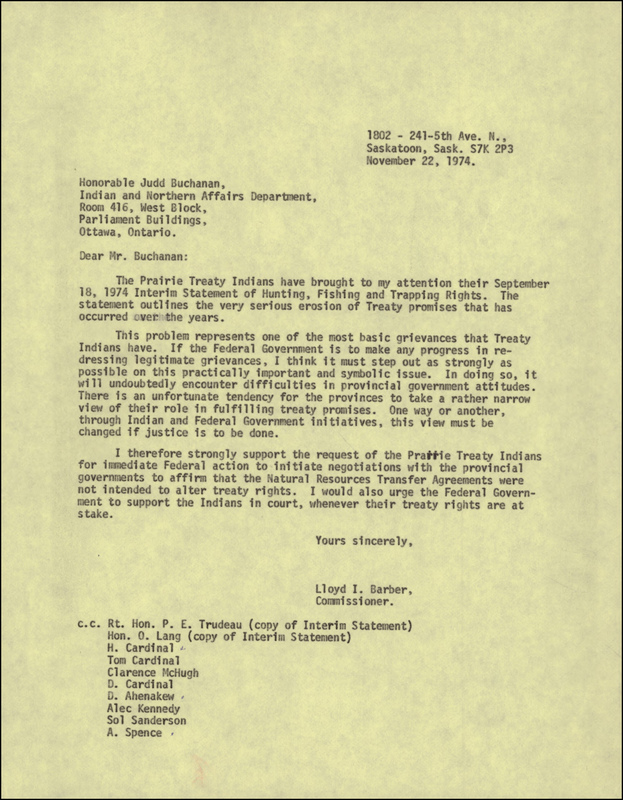 Appointments at the federal level are now restricted to federal public servants, but in the pre-Confederation era, appointments were granted through letters patent, now found in the sous-fonds of the Registrar General (RG68) held at Library and Archives Canada. 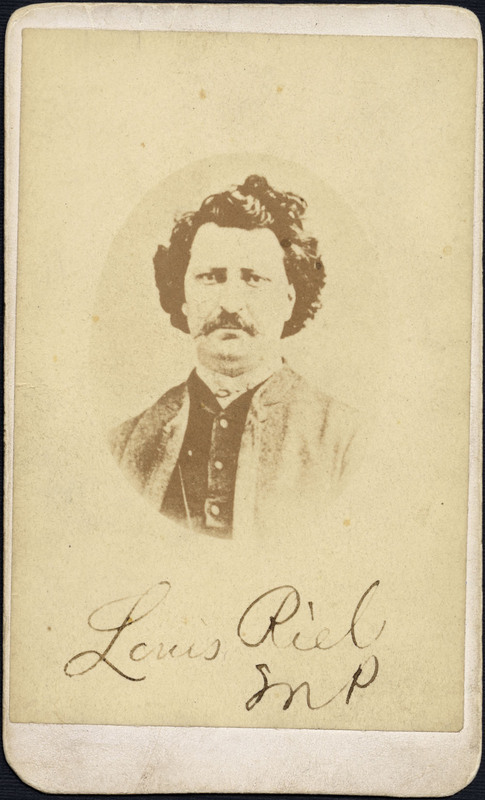 RG68 volumes 897 and 898, “General Index,” 1841–1867, available on digitized microfilm reel C-2884. Go to the corresponding page in the General Index. 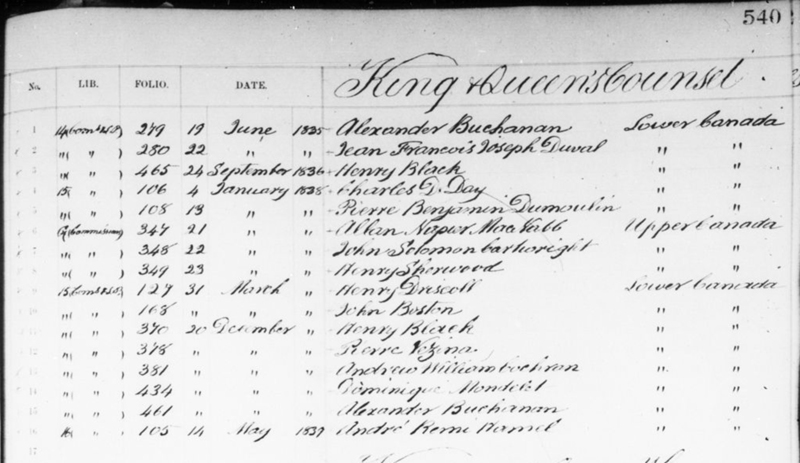 For example, you will find the index to appointments for pre-1841 records for both Upper and Lower Canada on pages 539 and 540. The post-1841 indices are on pages 316–318 for Lower Canada, and pages 318–320 for Upper Canada. Looking at page 540 of RG68 volumes 894 and 895, “General Index,” C-2883, as an example, we can read the list of names and select those of interest. Let’s take Alexander Buchanan as our example. The letters patent granting his King’s Counsel (KC) designation were issued on June 19, 1835, and can be found in liber 14 on page (folio) 279. Excerpt from page 540 of the General Index for pre-1841 records, specifically for King’s and Queen’s Counsel appointments. 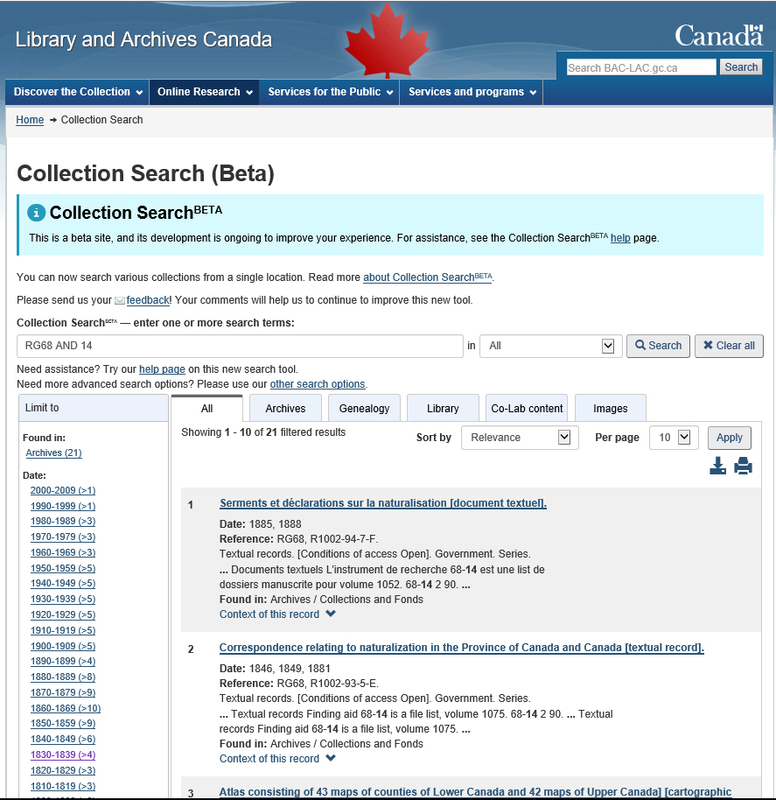 To find the specific liber within the record group (RG68), use Collection Search and follow the model below. The first and second screenshots below show the search screen and terms used while the third shows the item level result. A screenshot showing the search terms and first results page in the Collection Search (Beta) function. A screenshot showing filtered results by date. A screenshot showing the item level result. 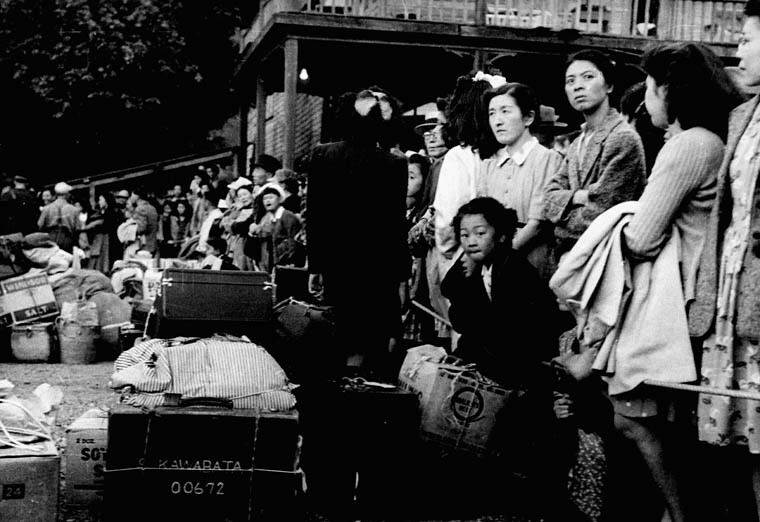 From the results page, we see that the document is available on microfilm, and in this specific case, it is available on digitized microfilm. We can then navigate through the reel until we find the relevant document and page. An excerpt of the text of the commission appointing Alexander Buchanan Esquire, King’s Counsel, in RG68 volume 110, file 14, page 279, found at image 514 of digitized microfilm reel C-3926. When Alexander Buchanan received the designation “KC” in 1835, Canada was just years away from the arrival of Queen Victoria to the British throne. This means that if he had still been practicing law in good standing at the time of her coronation, Buchanan would have changed the “KC” designation to “QC”, to reflect the female monarch. Similarly, current QCs in Canada will change their designation to “KC” upon the coronation of a king. 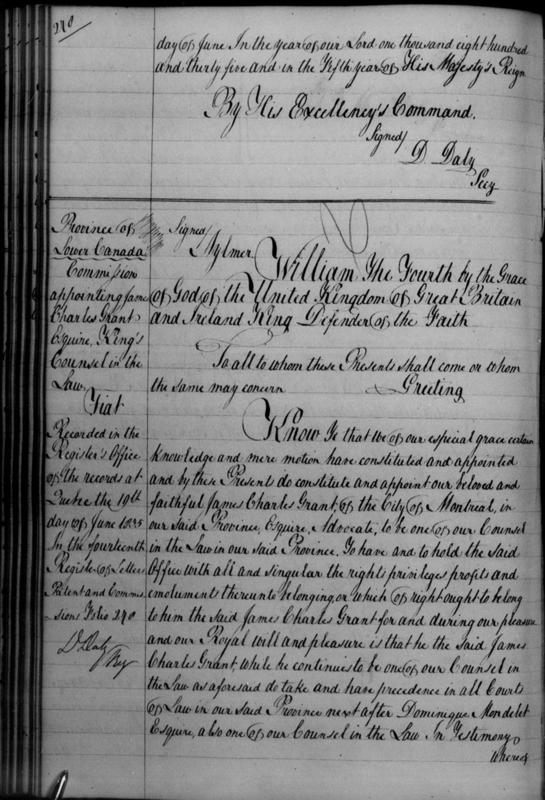 If you are interested in the history of King’s and Queen’s Counsel appointments in Canada, pre- and post-Confederation, I encourage you to review our holdings for related records and to do research to find out more about how the appointment is awarded in your home province or territory today. The year 2017 marked the sesquicentennial, the 150th anniversary of Canadian Confederation. As the nation celebrated this event, images of the Founding Fathers, the Constitution and Sir John A. Macdonald, Canada’s First Prime Minister, dominated the collective consciousness. Further away in memory was the path leading up to July 1, 1867: the Rebellion of 1837–1838, and the report of John George Lambton, Earl of Durham (Durham Report, Report on the Affairs of British North America), which recommended the union of the two Canadas. To explore the period before Confederation often requires a retrospective examination of the forms of government that existed before that date. The Act of Union of 1840 created a single province by merging Upper and Lower Canada into the United Province of Canada, which lasted from 1841–1867, ending (?) 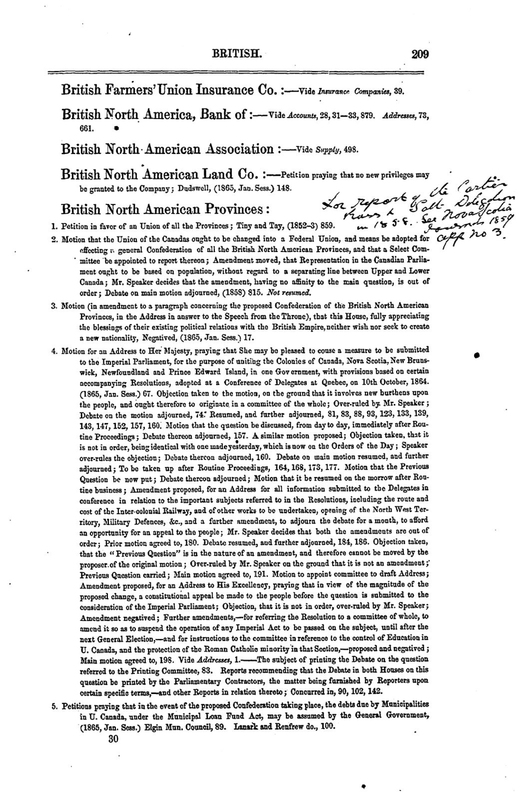 with the British North America Act, which created Confederation. The pre-1841 political entities of Upper and Lower Canada then became the provinces of Ontario and Quebec, respectively. The new Province of Canada brought some changes. 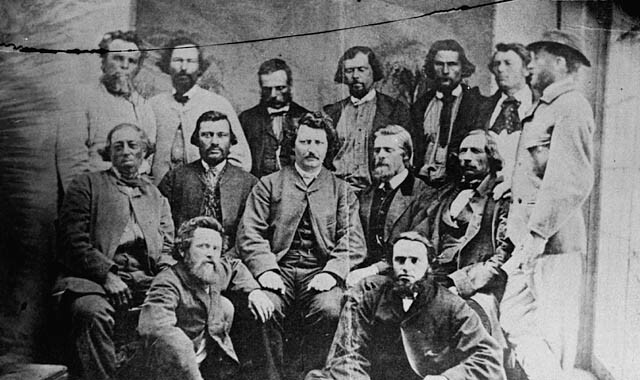 The Legislative Assembly of the Province of Canada replaced the Upper and Lower Canada Houses of Assembly and the Legislative Council of the Province of Canada, 1841–1866, replaced the Legislative Councils of both Upper and Lower Canada. 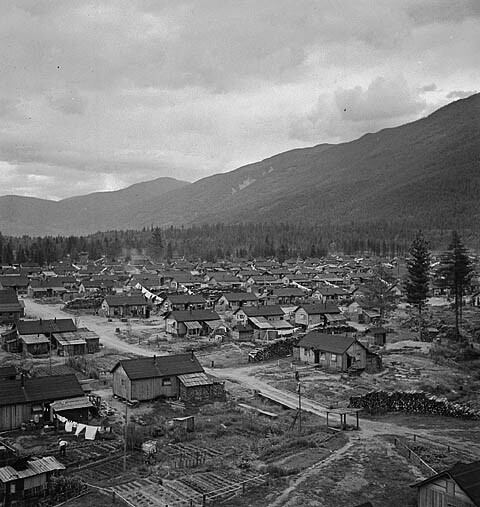 This brought about two new houses: the Legislative Assembly and the Legislative Council of the Province of Canada. 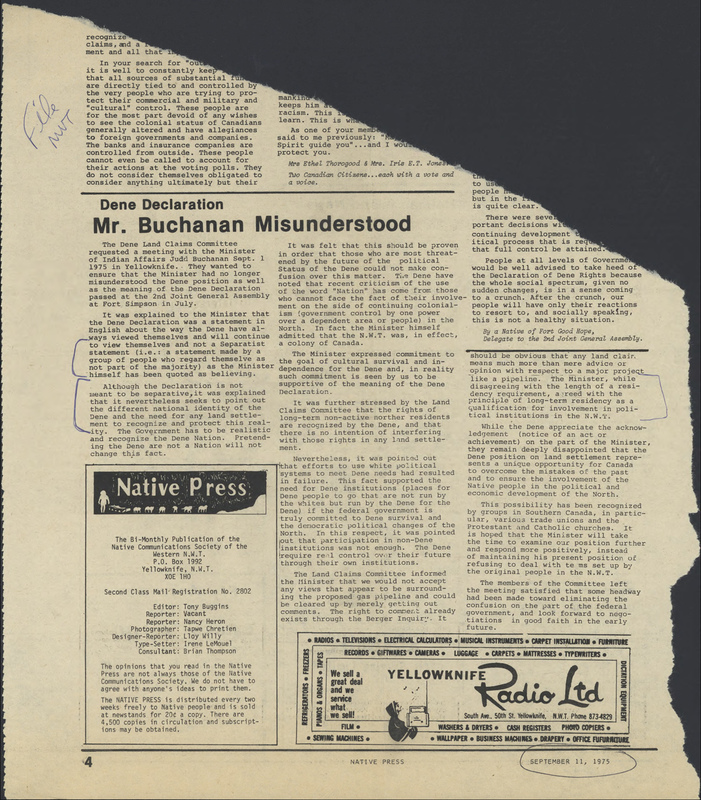 Both the elected Assembly and appointed Council of the new Province of Canada produced documents: debates, sessional papers, journals, votes and proceedings. These are all important research tools; however, this blog reviews only the journals of these houses. Journals are issued at the end of each session, with an index and appendices. Page numbering is continuous within each session. Reports that are tabled or filed in the Legislature are titled Appendices, and later Sessional Papers. They are assigned letters of the alphabet and cover a diverse range of subjects, from Transportation, Immigration and Indigenous Peoples. 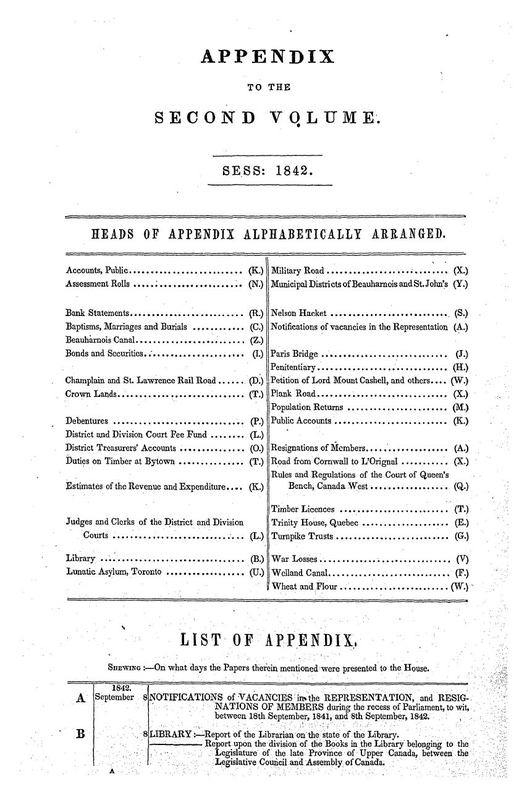 Appendices were published separately up to the year 1859, after which date they were included with the Sessional Papers. Appendix to the Journals of the Legislative Assembly, 1842. Source: Héritage. 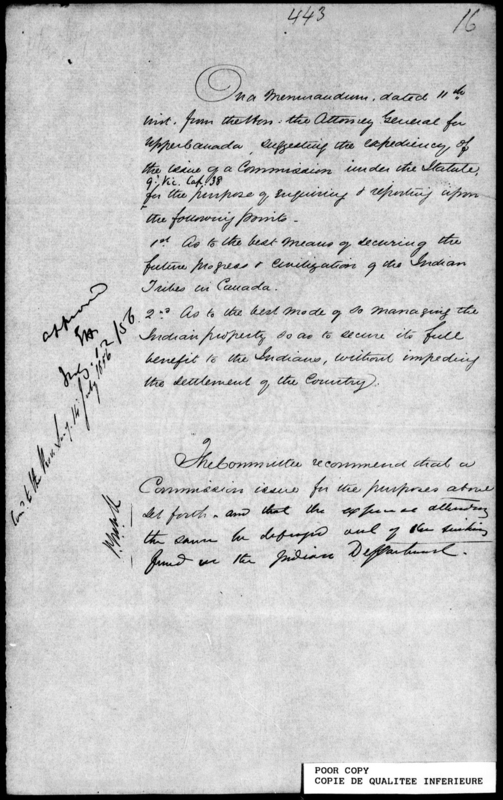 List of Appendices (List of Appendix), 1842. Source: Héritage. If the date of an event is known, it can be located by accessing the journals for the corresponding session of the Legislative Assembly. If the date is not known, access to journal content is via the two-volume General Index to the Journals of the Legislative Assembly of Canada. This index provides subject access with the year of the session and page numbers of the topic in the body of the journal. 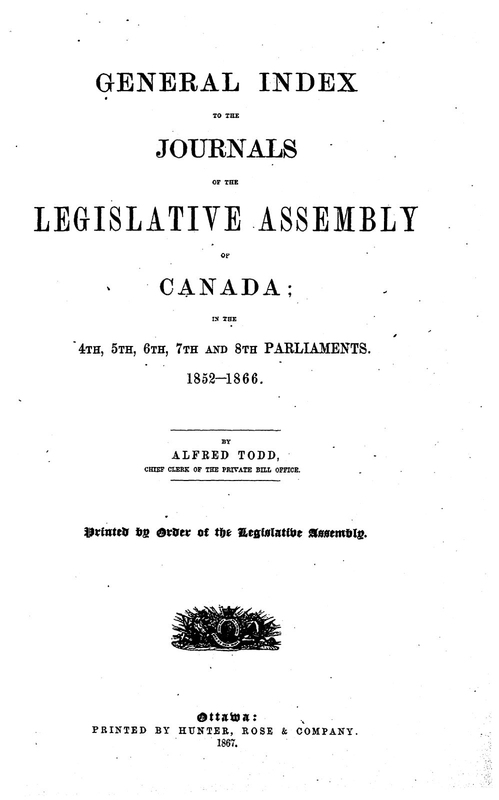 General Index to the Journals of the Legislative Assembly of Canada: in the 4th, 5th, 6th, 7th and 8th Parliaments, 1852–1866 by Alfred Todd, cover page. Source: Héritage. 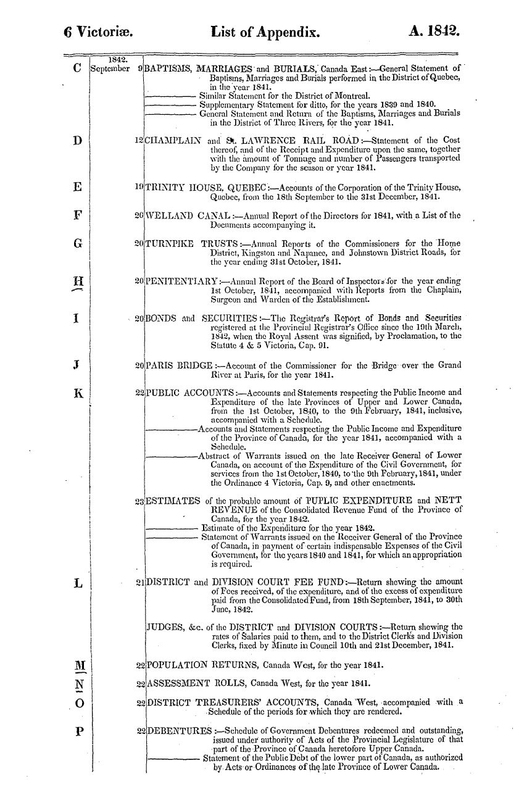 General index to the Journals of the Legislative Assembly of Canada: in the 4th, 5th, 6th, 7th and 8th Parliaments, 1852–1866 by Alfred Todd, page 209. Source: Héritage. The Journals of the Legislative Council follow the same format as those of the Legislative Assembly. The sessional journals have indexes and appendices. A cumulative index includes the indexes from the individual sessions. The Council’s reports and appendices were published separately as Sessional Papers until 1866 when they were replaced by the Sessional Papers of the Dominion of Canada. Journals of the Legislative Council of the Province of Canada. 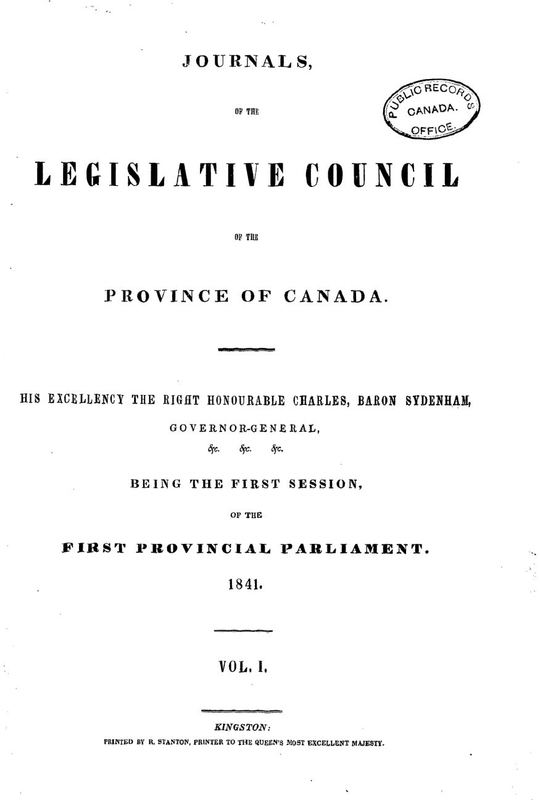 First session of the first provincial Parliament, 1841, cover page. Source: Héritage. The journals and appendices of the Legislative Assembly and the Legislative Council are available in English and French. 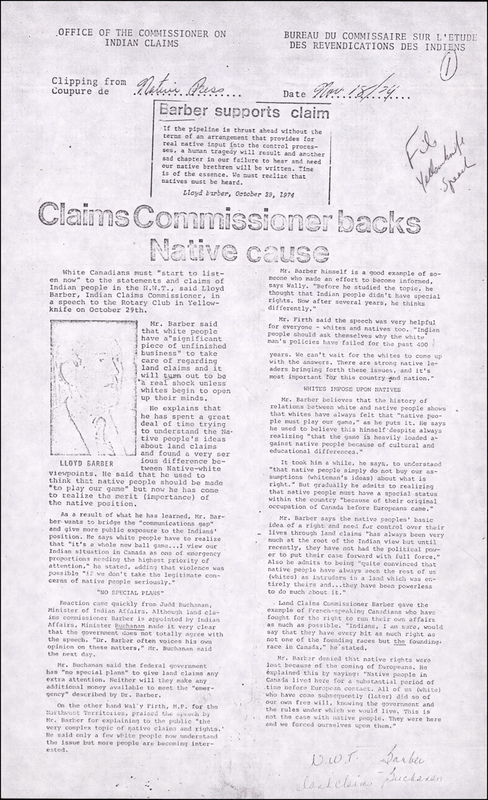 Many of the publications of the Province of Canada are available online in sources such as Early Canadiana Online. These documents also exist in alternative formats such as microfilm and microfiche, which are findable in the AMICUS online catalogue. The following publications provide additional information on the Province of Canada, its journals, appendices, sessional papers, and organization. This bibliography includes a list of departments with their publications. It complements the Appendices and Sessional Papers. Includes an analysis of parliamentary publishing and useful lists of legislatures and sessions, journals and appendices by session dates for both the Legislative Assembly and the Legislative Council, 1841–1866. 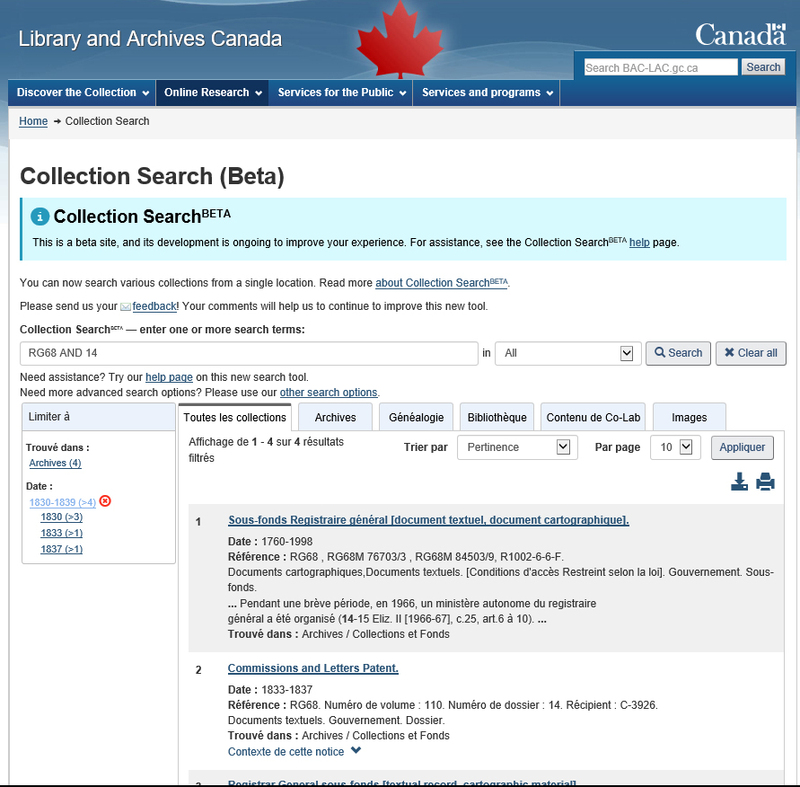 Should you need assistance in locating, retrieving or using the documents listed in this blog, please contact the LAC Reference Services. Sandra Bell is a Reference Librarian in the Reference Services Division of Library and Archives Canada. 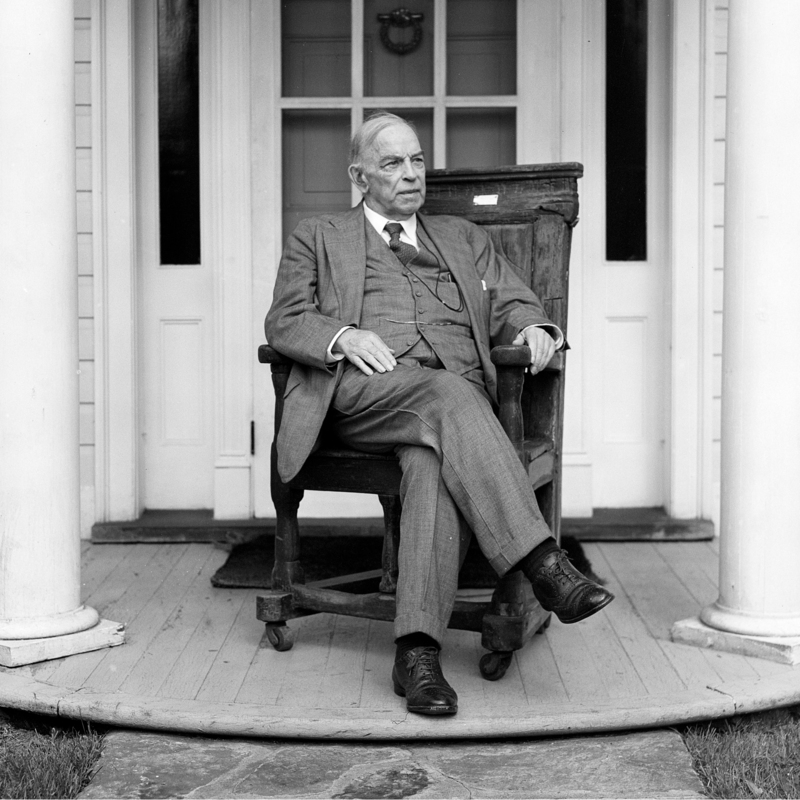 Library and Archives Canada is releasing its latest podcast episode, Mackenzie King: Against his Will. 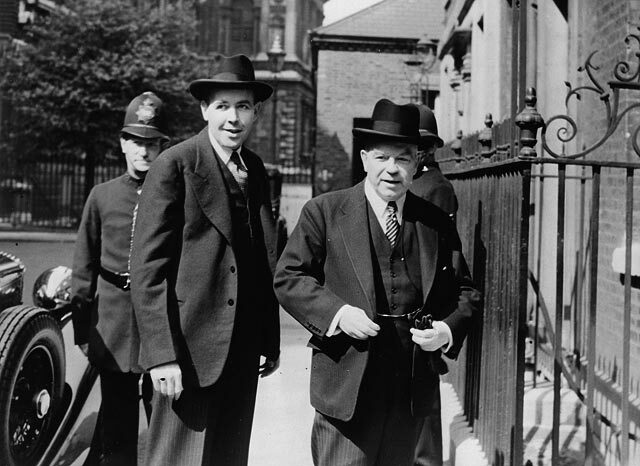 William Lyon Mackenzie King was Canada’s longest serving prime minister. He is also increasingly viewed as one of the greatest. However, King’s accomplishments are not restricted to the realm of politics. He was also a prolific correspondent and kept an ongoing, almost daily diary from 1893, until a few days before his death in 1950. In it, King not only wrote down meticulous accounts of his life in politics, but also included fascinating details from his private life. On today’s episode, we talk with professor and author Christopher Dummitt, whose latest book details the history behind the diaries and how they became available for the world to read. 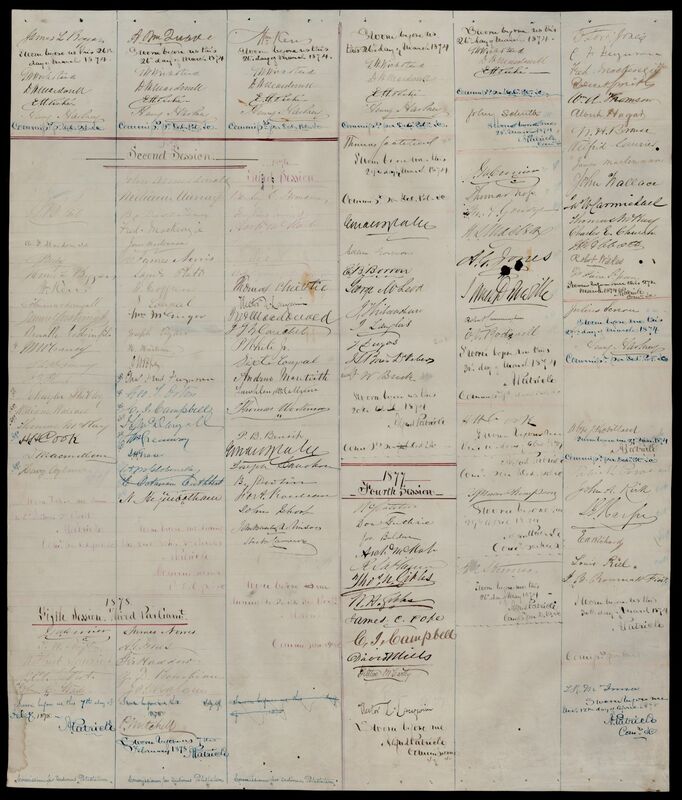 The recent addition of records to the Cabinet Conclusions database offers access to the attendance records, agenda and the minutes of Cabinet from 1977 to 1979. The minutes are not verbatim accounts of Cabinet meetings but provide excellent summaries of the discussions and various positions taken by Cabinet members. 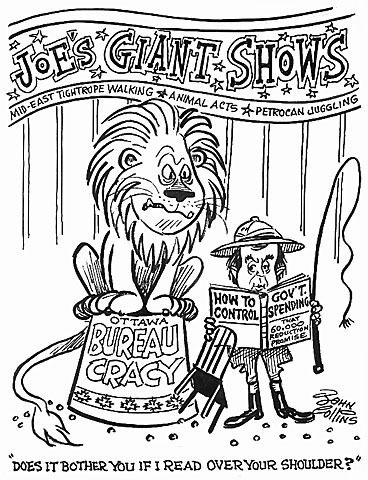 These newest records straddle both governments of Pierre Elliott Trudeau and the short-lived government of Joe Clark. 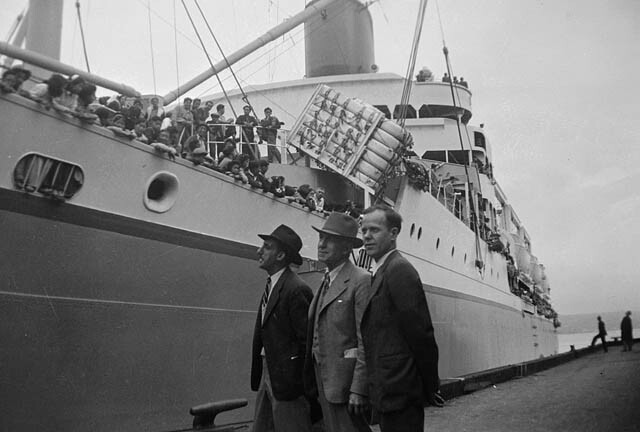 They cap off the long preamble to the repatriation of the constitution and the advent of the Charter of Rights and Freedoms. 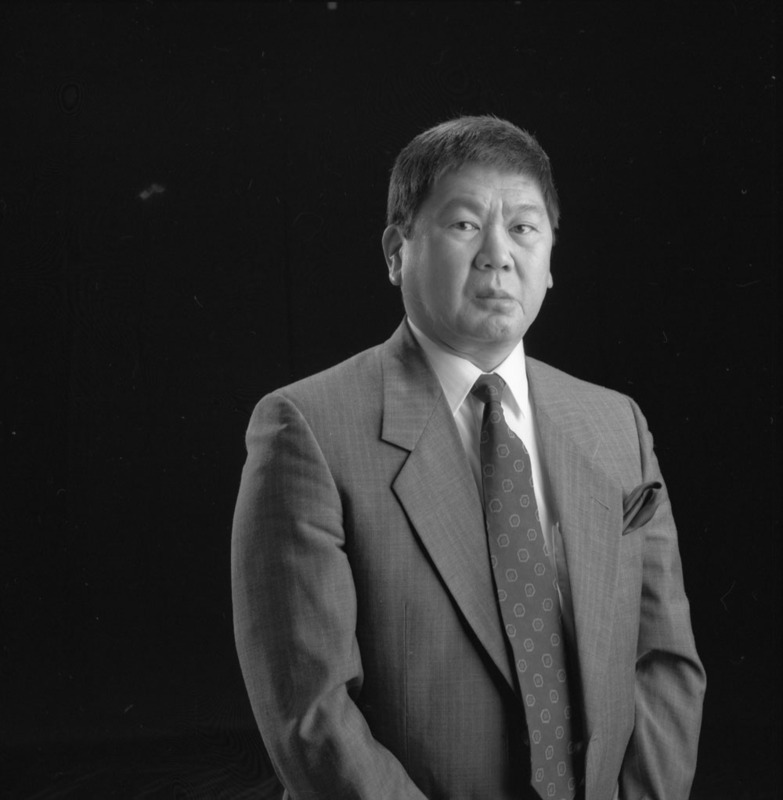 They are an important part of the corporate memory of the federal government and reveal a range of subjects, preoccupations, concerns and opportunities confronting the most powerful institutions in our parliamentary system. We might take it for granted that a democratic state provides some measure of transparency for those wishing to know why and how a decision is made. 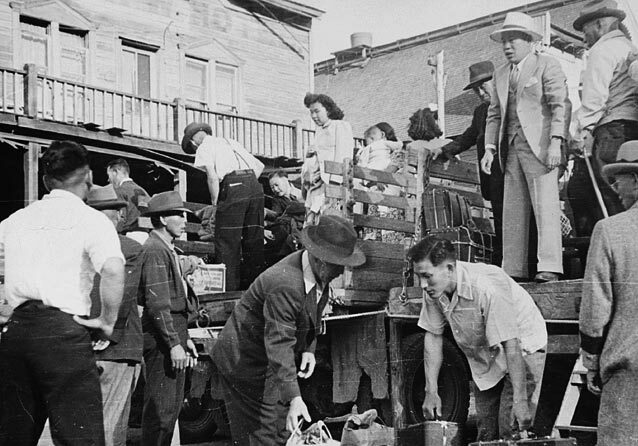 Our democratic sensibilities might be offended to know that, while we could probably trace our democratic heritage to well before the 1940s, it was not until then that Cabinet kept an agenda and minutes of its deliberations. The lack of records documenting Cabinet deliberations can encourage an exaggerated sense of the power of the Prime Minister. “The story went around,” writes historian Michael Bliss in his book, Right Honourable Men: The Descent of Canadian Politics from Macdonald to Mulroney, “that when Bennett was seen mumbling to himself, he was holding a Cabinet meeting.” When there are no official records to document Cabinet’s discussions, who is going to contradict the memory of the Prime Minister? From 1867 to 1940, a succession of six men served as Clerk of the Privy Council; their duties reflected the comparatively modest role of the state in Canadian society before the Second World War. 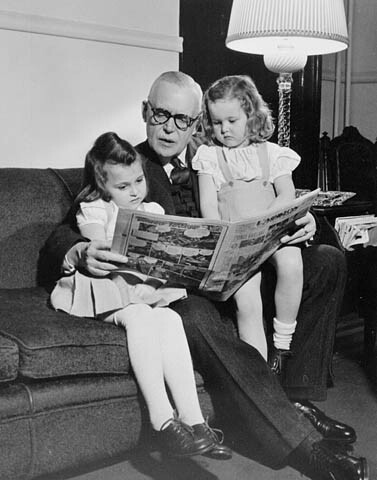 But with the appointment in 1940 of Arnold Danforth Patrick Heeney, things were clearly changing. Heeney became the seventh Clerk of the Privy Council since Confederation and the country’s first Secretary to the Cabinet. 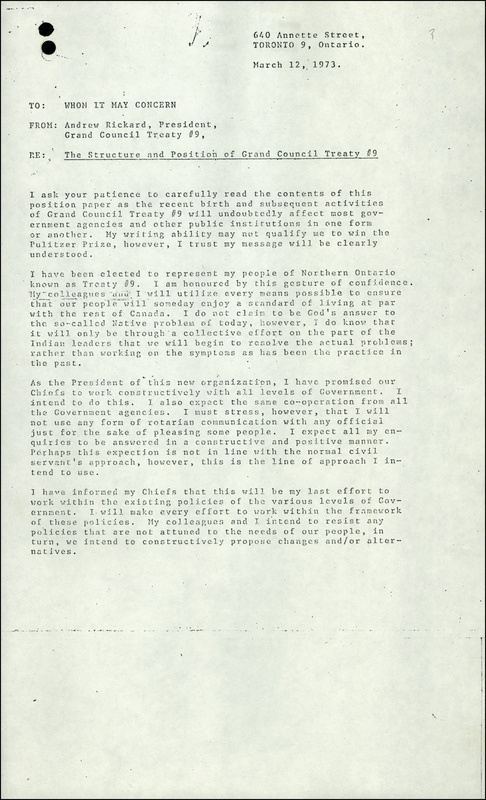 Order-in-Council PC 1940-1121 ushered in a significant change in the universe of government information, but it was not until 1944 that the formal Cabinet Conclusions were created and preserved. 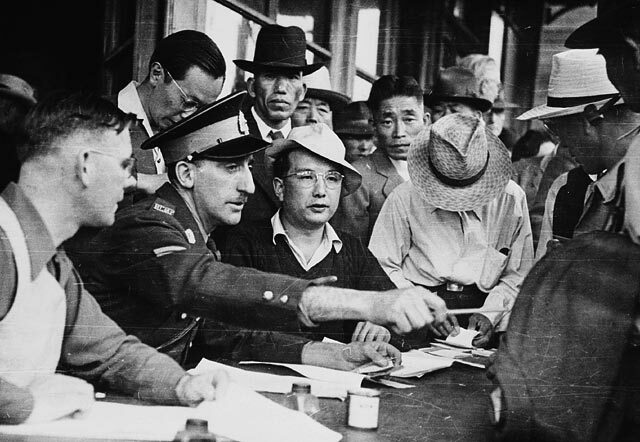 In the absence of these official records, researchers have to look to Prime Ministers’ personal papers to perhaps discover some form of documentation of Cabinet meetings. The Cabinet Conclusions have practical value for the administration of the state and democratic significance for the insight and transparency they make possible. More than mere instruments of modern bureaucracy, they offer an inside look at the deliberations, discussions, debates and decision making of the federal government’s most powerful politicians and, to a degree, the high-ranking bureaucrats who serve them. 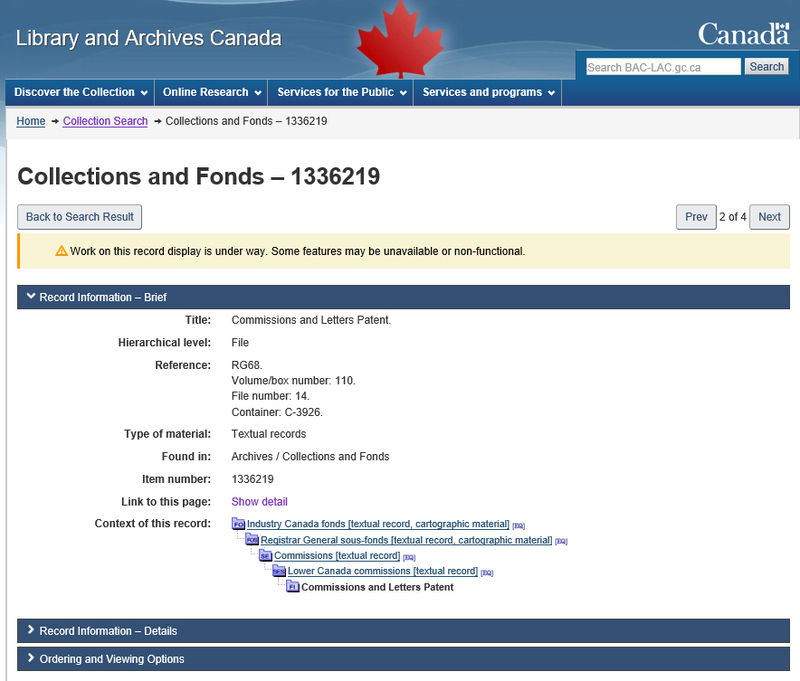 Library and Archives Canada’s acquisition and preservation of these records along with the access it helps facilitate, provide a revealing window into the workings of our democratic state. 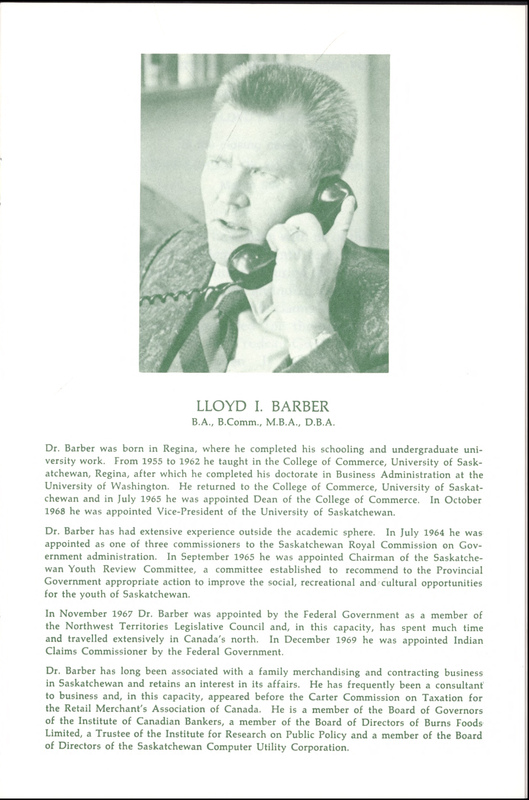 The latest additions to the database close out the 1970s, and will inspire new insights into the history of Canada, and about the federal government, particularly those entrusted with its leadership. Researchers can search the Cabinet Conclusions by keyword (one of their own choosing or one from a list of keywords capturing a handful of major issues confronting the government in each year), dates, agenda and records of attendance. The Conclusions offer more than documentary evidence of government deliberations and decision making; they are a means of discovering other Cabinet documents. In other words, the Conclusions can offer you the answers to complete your search, but they can also act as the beginning of your search for more and better answers. 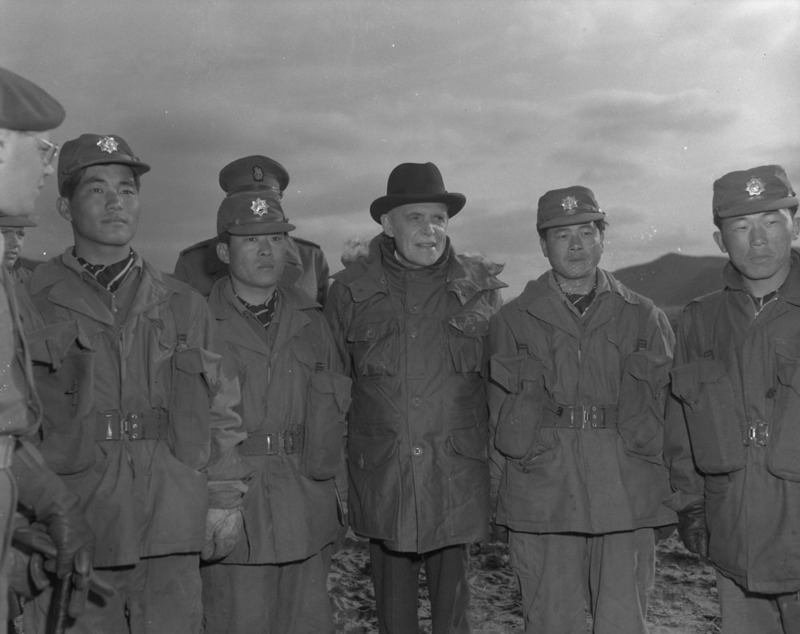 In addition, the Conclusions are a means of discovering related Cabinet documents, which may include backgrounders and Cabinet memoranda that informed discussions around the Cabinet table. Those records are not digitized and are not available in the database. 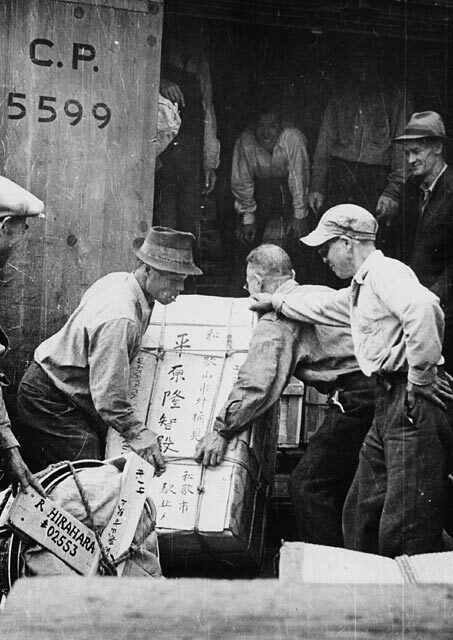 However, researchers will find references to those Cabinet documents in the Conclusions—and once the number of a document is known, it can be searched using the year it was created and the finding aid 2-15 to locate it. See the Cabinet Conclusions database for more detailed instructions on search options. 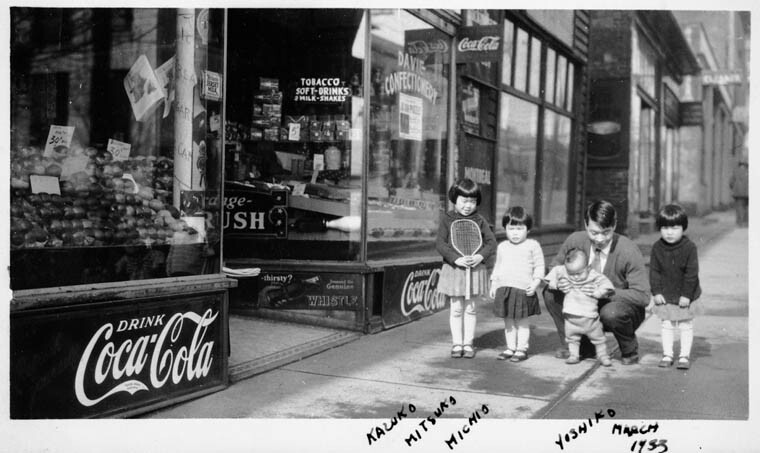 Michael Dufresne is an archivist in the Government Archives Division of the Archives Branch at Library and Archives Canada.